In early spring, tiny buds on the vine start to swell and green leaves appear. Appearance of the first green leaves through the bud scales is called budbreak. Growth is slow at first. As the mean temperature in the spring and early summer rises, growth and shoot elongation accelerate. Several weeks after budbreak, the period of most rapid growth begins - where shoots can grow an average of one inch or more per day. As the days warm up, flowers bloom, and then eventually make way for the tiny green grapes that will eventually ripen into clusters. Berry size of the grapes increases rapidly. Sunlight and warm temperatures are vital to the grapevine, and the warm sunshine during Iowa’s summer means extra love for the grapes grown here! The point in the growing season when ripening grapes begin to soften is called veraison. During this ripening process, all of the colored (or “red”) varietals gradually change color from green to various shades of red, purple, or black, while green (or “white”) varieties become more translucent. Sugars start to accumulate in the berries as this process happens. It is around this same time that many vineyards decide to apply netting to deter birds from destroying the crop. The interval from veraison to harvest varies for each variety. Unlike other types of fruits, once grapes are picked, they do not become sweeter, so the harvest timing of grapes is critical. Determining when grapes are ripe and ready to be harvested depends on the preferred levels of acidity, pH and residual sugar content. In some Iowa vineyards, harvest timing is also determined by weather and when harvest workers can be scheduled. Often, vineyards in Iowa will schedule “harvest parties” on the weekends where volunteers are invited to come and help harvest the grapes early in the morning, usually in exchange for a meal, T-shirt or even free wine! 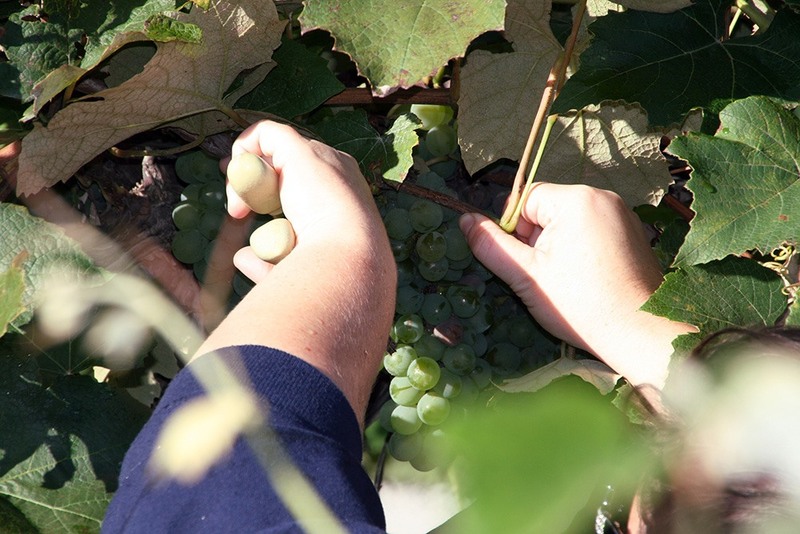 Shortly after picking, the grapes are processed immediately on-site, transported to a winery purchasing the grapes, or transferred to a cold storage facility. Once harvest is over, this doesn’t mean the work ends at the vineyard! The winter months are just as important part of the Iowa grape growing lifecycle as the active summer months. During the winter, grapevine growth and development stop temporarily and the vine is allowed to rest in a stage called “dormancy.” Beginning in late winter or early spring, growers get busy pruning the vines in preparation for the next cycle to begin. Pruning and training of the vine are two of the most important aspects for quality grape production, where grape growers can determine how much and which parts of the previous season's growth to remove in order to regulate vegetative growth of the shoots and leaves, and crop load (berry clusters) to produce quality grapes and optimum yield the upcoming year. Iowa’s grape growers repeat this same process each year for a quality locally grown grape crop! In early spring, tiny buds on the vine start to swell and green leaves appear. Appearance of the first green leaves through the bud scales is called budbreak. Growth is slow at first. As the mean temperature in the spring and early summer rises, growth and shoot elongation accelerate. Several weeks after budbreak, the period of most rapid growth begins – where shoots can grow an average of one inch or more per day. As the days warm up, flowers bloom, and then eventually make way for the tiny green grapes that will eventually ripen into clusters. Berry size of the grapes increases rapidly. 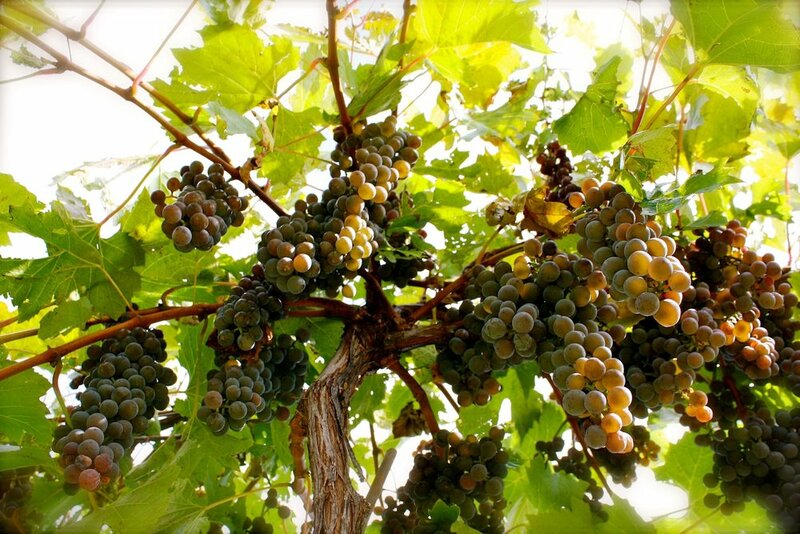 Sunlight and warm temperatures are vital to the grapevine, and the warm sunshine during Iowa’s summer means extra love for the grapes grown here! Determining when grapes are ripe and ready to be harvested depends on the preferred levels of acidity, pH and residual sugar content. In some Iowa vineyards, harvest timing is also determined by weather and when harvest workers can be scheduled. Often, vineyards in Iowa will schedule “harvest parties” on the weekends where volunteers come in and help harvest the grapes early in the morning, in exchange for a meal, T-shirt or free wine!